When designing a casting, active participation should take place between the Design Engineer, the casting producer and the machining source. Meloon Foundries LLC does this through direct contact with the casting buyer. The chart establishes general guidelines, the type of metal and other variables that will affect the casting cost directly linked to the process. Tolerances, inches +/- .030 in. +/- .030 in. +/- .050 in. +/- .015 in. +/- .020 in. Permissible Weight of Casting Oz – 1500 lbs 5 – 2000 lbs. 100 lbs 75 lbs. Oz – 100 lbs. Thinnest Section Castable, Inches 1/10 in. 7/32 in. 1/8 in. 1/32 in. 1/16 in. A significant variable in the construction of a pattern is the determination of the shrink factor. The shrink factors vary for different metals and also the configuration of the part. The number of impressions, the gating system, the process or methodology will affect the casting cost. This is better left to the foundry and pattern maker to determine. The chart provides typical mechanical properties for aluminum alloys and copper base alloys commonly cast by Meloon Foundries. Bismuth is substituted for lead in above alloys – Alloys are lead free. Additional information may be obtained by contacting Meloon Foundries or The Non-Ferrous Founders Society. Over 6 0.0300 +/- 0.003 in/in. over 6 in. Projected area of casting A1xA3 sq in. 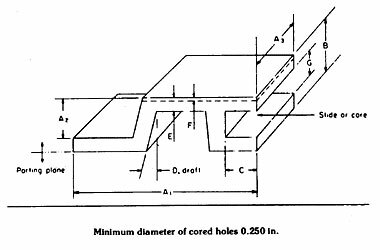 Additional tolerance for parting plane, in. Projected area of casting affected by core,A3 x G sq in Additional tolerance for core, in. Normally, a drawing does not show draft. Standard foundry practice is to “add” draft to the part. For the amount of draft required depends on design and type pattern. Maximum dimension, in. Nominal allowance, in. It is important that the foundry and the casting purchaser work closely together in order for the casting producer to make an acceptable cost effective part. Producing a casting for the first time entails a certain amount of trial and error. It is an experienced-based development process. The expertise and past experience with similar casting configurations provide a guideline for the initial production. Usually the more intricate the casting design and the more drastic the change in section thickness the less predictable the casting soundness. This is why it is important to consider location of isolated heavy sections, uniform wall thicknesses and correct placement or ribs and junction design. Visual casting soundness many times is not sufficient to verify acceptability and machining the sample casting prior to production release is important. Over specifying can increase the cost of a casting appreciable. Proper alloy selection, welding permissibility, correct choice of temper, and final inspection criteria all figure into casting cost. Under specifying leads in many cases to misunderstanding between the casting producer and the casting supplier. Castings that are designed for critical applications require specific quality criteria. Selection of material that does not meet environmental or mechanical properties frequently leads to poor casting performance. What are the requirements of first run or sample castings? Is 100% casting layout required? What inspection standards are required: x-ray or liquid particle inspection? Tolerances and dimensions must be clearly legible on the raw casting and machined casting drawings? Is written sample approval requested? Surface finish, packaging or shipping requirements specified? Price, delivery and production quantities should be clearly defined. Casting certification critical to casting performance must be agreed to in the quotation. Mechanical and physical test must be specified. Rapid Prototyping is the developing of a temporary pattern or tooling from a 3-D computer design. This temporary tooling reduces casting time from months to days. The computer model is used as the blue-print and its dimensions to produce a model. Any rapid prototype pattern that is durable enough to withstand green sand or no bake molding can be used. There are several rapid prototyping processes and the selection depends on the application.